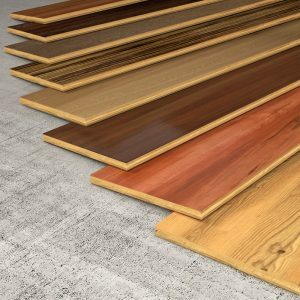 You have many options for your engineered hardwood flooring! There are two main types of hardwood flooring: solid and engineered. Solid hardwood is exactly what it sounds like, strips of wood cut straight from a tree. Engineered flooring, on the other hand, is multiple thinner strips of wood that have been carefully adhered to one another. Solid and engineered hardwood are both great flooring options. If you’re like roughly 30% of the hardwood floor owners in the United States and choose engineered flooring, you have many options! Oak is by far one of the most popular species of hardwood flooring. It is widely available in a variety of colors and shades. It’s also easy to take this inexpensive engineered hardwood option and make it your own with different stains and finishes. Acacia is one of the more popular exotic flooring species. It’s wide variations in grain patterns and shades make an Acacia wood floor an attractive part of any interior design. Other popular exotic woods are Teak and Koa. Maple is a great flooring species to choose when you want your space to feel brighter. Engineered Maple flooring tends to have lots of grain pattern and shade variations between planks, which once the floor is put together creates a gorgeous visual effect. The light color brightens the space and lightens the mood. Traditionally, flooring planks are about 3 inches wide. Wide plank flooring is a popular choice for homeowners who want to achieve a more custom look with their engineered hardwood. Because the planks are wider, you are able to see more of the wood’s grain pattern and the effect is eye-catching. Two of the options homeowners choose to save time are pre-finished or pre-stained engineered hardwood. The installation time for these options can be shorter because there’s not a waiting period while things dry. Your flooring professional will be able to help you figure out which options work best for you and your space. This entry was posted on Friday, September 28th, 2018 at 2:39 pm. Both comments and pings are currently closed.